Radio Program of the 1-18-2001 Protest at the Tom Corbett inauguration. This radio program is one hour long. Extensive coverage of the January 18th Rally for Clear Air, Clean Water, and Clean Land at Governor Corbett’s Inauguration. Concept, writing and editing by abe and Iris; research and interviews by Iris; engineered and produced by abe. One has to wonder where all of this advice was a few years ago when landowners in Pennsylvania were initially being approached to lease their land’s mineral rights and being promised deals too good to be true. It’s what should have been from the outset. Lawyers, accountants, and other experts available to help landowners navigate these leases and all the questions that come from the complicated natural gas hydro-fracking development. 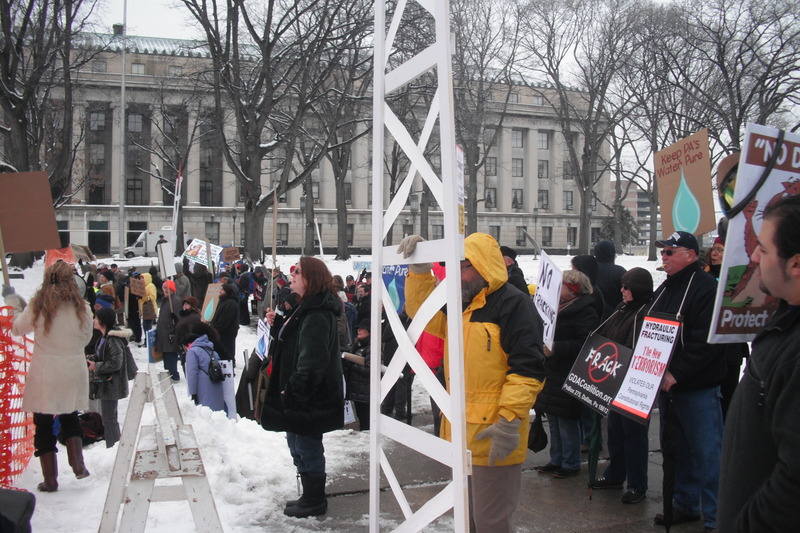 Listen to the latest episode of WFTE’s “Frack Radio”, featuring extensive coverage of the January 18th Rally for Clear Air, Clean Water, and Clean Land at Governor Corbett’s Inauguration. Plus hear the exclusive interview with Associated Press Journalist David Caruso. February 28th will be an important day to keep an eye on as Quebec’s environmental evaluation agency is scheduled to deliver it’s report on shale gas drilling. While Quebec has not issued a moratorium as of yet, the Ottawa Citizen and Montreal Gazette report that Environment Minister Pierre Arcand has stated that “The industry is not in control of the situation,” and that he is “extremely concerned.” Read the Ottawa Citizen January 21, 2010 article here. “The rest of the world is watching in horror of what you are allowing to happen” are the words of Beth Strudley to the Silt Board of County Commissioners during a recent meeting. Nosebleeds, rashes, and passing out. These are the symptoms a family in Silt Colorado are experiencing these days. Their doctor has told them to move out of their home immediately. Gas driller Antero Resources is who the family says is to blame for polluting their air with gas fumes and their water from hydraulic-fracturing. Protecting Our Waters Director Iris Marie Bloom spoke with reporter Laura Vecsey at length during the recent Gas Truth of Central PA Harrisburg Rally and she came away from the conversation with the belief that Laura is both a serious and strong thinker. 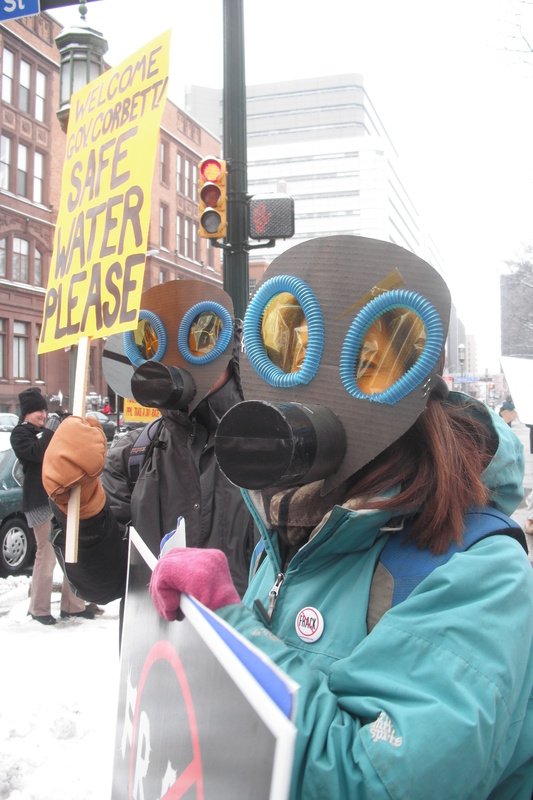 Laura’s article is accompanied by photos (POW’s homemade gas masks once again show up and seem to have been a popular favorite at the Rally) and a short video highlighting how protesters could be heard at the new Governor’s inauguration. The video along with Laura’s words “On the steps of the state Capitol, Corbett seemed to strain to take in the mild applause of a well-heeled audience that was almost drowned out by Marcellus Shale gas drilling protesters” show that everyone present to support the Rally’s cause got the message out loud and clear. Representative Greg Vitali was one of the few, if not the only PA legislators who came out to listen and share information with those of us at the Rally who are deeply concerned about shale gas drilling, the environment, justice, and human health. It is good to see his comment at the end of this article. Video from BBC News; Shale gas: an energy saviour? From a December 2010 episode of BBC Newsnight is a great 12 minute film called ‘Is extraction of shale gas by fracking safe?‘ There is something valuable in stepping outside from the middle of the storm and looking at all of this from an outside perspective. BBC Newsnight’s Science Editor Susan Watts with this film and the following article from BBC Environmental Analyst Roger Harrabin show us a European view of all that is happening in our backyards right now. From the UK’s The Ecologist comes this 4 minute short film about natural gas drilling and hydro-fracking in Pennsylvania. The rest of the world is keeping an eye on what is happening here. To read about the investigative work that goes along with this film, check out the article titled; “US natural gas drilling boom linked to pollution and social strife“. Pennsylvania Gov. Tom Corbett seems to have heard protesters today during his inauguration speech…but will he listen? Whether it was one person, 100 people, or two hundred people as some estimates say, the Gas Truth of Central PA rally earlier today was impressive and made it’s mark. A spirited crowd armed with great signs, clever costumes, and loud voices made themselves heard. Some of the early articles are saying we could be heard chanting and voicing our concerns as citizens of Pennsylvania, making it tough for Corbett’s audience to hear his speech. ‘Gas-drilling protesters chant during Pennsylvania Gov. Tom Corbett’s speech‘ from PennLive.com and the Patriot News has some great photos. ‘Corbett takes oath as 46th Pa. governor‘ article from the My San Antonio web site quotes Senate President Joe Scanati as saying; “No doubt the First Amendment is alive and well in Pennsylvania today” in response to chants of “Tom Corporate — no way, no fracking in Pa.” from the gathered protesters. ‘York countians attend Corbett inauguration, for support and protest‘ states that although the protesters couldn’t hear Tom Corbett’s inauguration speech, he could certainly hear the voices of the public concern. Philadelphia, PA, Jan. 17 – Gas masks and all, about 50 Philadelphia area residents brave ice to rally in Harrisburg for clean air, water and earth just prior to the inauguration of Tom Corbett as Governor January 18th. “Human health is central to our concerns about the technology called ‘fracking’ – high-volume hydraulic fracturing with horizontal drilling, a mile down under. We know for sure it degrades water quality. Now scientific evidence is mounting that this dangerous new type of drilling, which uses toxic chemicals and also releases radioactive materials from deep underground, hurts human health,” said Philadelphia physician Poune Saberi of Protecting Our Waters. The citizen action group urges the Pennsylvania legislature to pause all gas drilling permits at least until the EPA has finished its study of hydraulic fracturing’s risks to water and air. POW also believes the Delaware River watershed, which provides Philadelphia with 100% of its drinking water, should be set aside completely from fracking because toxic contaminants from fracking are turning up in water and air, and are linked to serious illness and fatal diseases such as pancreatic and adrenal cancer and leukemia, in several states. New York State has a moratorium on gas drilling in place. The state of Arkansas issued a moratorium on all new gas drilling permits in December. Wyoming has new rules in place requiring natural gas drillers to disclose chemicals used in hydraulic fracturing. But in Pennsylvania, the only gas drilling state which doesn’t even tax natural gas production, citizens feel increasingly frustrated that officials fast-track permits for gas drillers, who benefit from federal environmental exemptions and from the lack of any cumulative impacts study in Pennsylvania. The Halliburton Loophole refers to a set of exemptions gas drillers won in 2005, exempting hydraulic fracturing from many federal environmental laws including the Safe Drinking Water Act, Clean Water Act, Superfund Law, waste treatment and community right to know laws, and Clean Air Act. Hydraulic fracturing, or fracking, is the high-pressure injection of hundreds of thousands of pounds of chemical-laced fluids into wellheads to force gas deposits to the surface. Fracking has polluted groundwater in Wyoming, Colorado, Texas, Pennsylvania, New York and other states. In December, the EPA confirmed the presence of benzene, a carcinogen, in drinking water wells in Parker County, Texas, linked to fracking operations by Range Resources, which also drills in Pennsylvania. “Drillers dumped 44,000 gallons of toxic waste into Neshaminy Creek outside Philadelphia when there was supposedly a moratorium; I don’t trust them, ” commented Austin Kelley, a Protecting Our Waters advocate. “This drilling pollutes our water and air, hurting local communities,” he said. “We are putting our health and ecosystems at risk, and for what?” asked Protecting Our Waters director Iris Marie Bloom. “Ben Franklin said you don’t know what your water is worth until your well runs dry. Fracking pollutes water permanently; this is consumptive water use combined with deforestation, community destruction, and underground toxic injection which puts future generations at risk. All this for an energy source which, scientists now say, is at least as dirty as coal in greenhouse gas emissions! “We are going to Harrisburg to tell Governor Corbett, Patrick Henderson, and the public: Dirty drilling is not acceptable. Public health is a bottom line issue. Don’t give us dirty gas, give us clean AWE: Air, Water, Earth,” Bloom concluded. Protecting Our Waters joins Gas-Truth of Central Pennsylvania, Marcellus Protest from western Pennsylvania, Northeastern Pennsylvania Citizen Action, and grassroots organizations statewide, at the rally. Tom Corbett accepted close to a million dollars in campaign contributions from gas drillers, and put gas drilling company lawyers and lobbyists on his transition team. One of the Protecting Our Waters carpool departure points is 48th Street and Baltimore Avenue, where “Protectors” will gather — signs, gas masks, and all – at 7:30 AM before a 7:45 AM departure. Take a look and get to know who incoming Governor Tom Corbett has appointed to Pennsylvania’s top environmental and energy positions. These men will be the ones who head the DEP, creating and molding new industry regulations, running inspections and levying fines, and overseeing everything from how waste/produced water is handled to how drilling permits are sold. We’ll have to wait and see how effective and aggressive they will be since their boss Corbett accepted over $800,000 in contributions from the natural gas industry over the last few years. Read more in this Scranton Times Tribune article “Corbett names DEP team“. And don’t forget to join in on the Tuesday January 18th rally in Harrisburg being organized by Gas Truth of Central PA. Over 100 organizations from across Pennsylvania are coming out at 10:30am to Soldier’s Grove right behind our State Capitol building to send a clear message to incoming Governor Corbett that citizens want the Precautionary Principle, truth and the science to speak when it comes to drilling in the Marcellus. Check out our January 4th posting under Action Alerts for more information or go to Gas Truth of Central PA’s Facebook page for the latest updates. Hope to see you there!